It’s no secret that I absolutely love supporting and working with the bubbling entrepreneurial community of artists and startups in my little town of Brooklyn. Needless to say, when I heard about With Love, From Brooklyn (thank you Daily Candy), I didn’t need much convincing. Darla Furlow is definitely my kind of people, recently launching this online shop selling carefully curated care packages filled with only the best local sweet and salty treats, grouped by theme and shipped to your foodie friends, family or clients. Of course you could always schlep around the city putting together a care package yourself, but when her baskets don’t break the bank and each product has already been taste-tested by a panel of local food lovers, how can you go wrong? 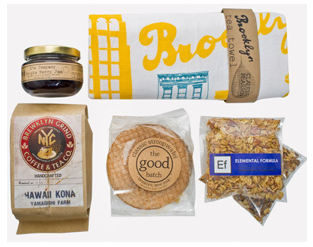 Check out Darla’s rotating selection of goodies at With Love, From Brooklyn and let your people outside the borough know where it’s at. This entry was posted in Handmade, Social Media, Uncategorized and tagged Brooklyn, Brooklyn Care Package, Brooklyn foodie, Daily Candy, Darla Furlow, foodstuffs, From Brooklyn, New York Care Package, New York foodie, With Love on February 14, 2012 by Stacy.